1. April 7th, 2007 - Just before and throughout a 2 week mini-tour (Purdue IN, Columbus OH, Pittsburgh PA) Cristina was not feeling well (upset stomach, dark urine, not eating, tired). 2. April 21st, 2007 - Cristina has pain in her left kidney during a tango workshop in Pittsburgh. 3. April 23rd, 2007 - Cristina goes to the ER were she is diagnosed with renal failure and is admitted to the Montefiore hospital. She undergoes many tests and begins receiving treatment for an agressive kidney disease (see below for treatment info). 4. 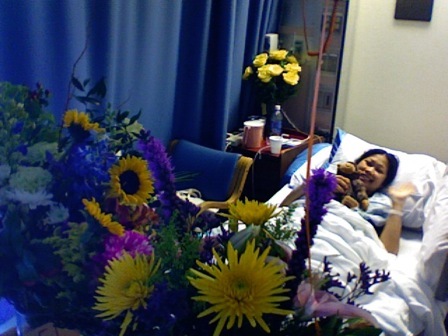 May 10th, 2007 - Cristina was transfered to the UCSF Hospital where she continues in-patient treatment. Doctor's are still trying to determine the exact nature of Cristina's kidney failure. They believe it is a type of auto-immune disease brought about by perhaps a viral infection of some sort (although we will really never know). The specific nature of her auto-immune disease appears to be anti-glomerular basement membrane or AGBM for short. The disease is also described as a type of acute Glomerulonephritis typically know as Good Pasture's disease (without the lung failure). The generic treatment for such auto-immune diseases are all very similar and involve a cocktail of plasmapheresis, steroids, and chemotherapy (Cytoxan). Doctors have determined that Cristina's Creatine level (indicator of kidney function, normal is between 0.4 to 1.4, Cristina's is still above 3) & AGBM antigen level (titer marker below 3) are low enough for her to stop Plasmapheresis (she's had 18 to date) and continue with steroids and chemo. Also, they believe Cristina is stable enough to be discharged and continue treatment at home for the next two to three months. However, the plasmapheresis catheter will remain embedded in her chest for the time being in case they need to return to this treatment. Cristina is glad to be home. We've fortified the house with an air purifier (Ionic Breeze), new adjustable shower bar, hand sanitizer, and a plethora of other medical oddities... Cristina will continue Cytoxin & Steroid treatment at home with regular visits to our renal doctor. To date there are many side effects, including elevated sugar levels, high blood pressure, nausea, head-aches, lupiness, swelling, etc. There are no less than 14 medications which are part of an intricate balancing act to keep Cristina immuno-supressed while battling the side-effects of the treatment. 9. May 27th, 2007 - Unexpected/Wrong Bills, etc. 10. June 9th, 2007 - Insurance wise we have learned to be patient and speak nicely. This has cleared up alot of the erroneous statement activity. 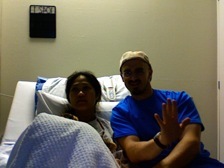 We are waiting for the insurance company to more fully process Cristina's case work and start officially billing us. On the other hand we deal with the irony of prescribed medications. While the insurance company has authorized a full dose of chemo and steroid drugs for each month they only allow Cristina to pick-up nine anti-nausea pills at a time. She needs at least 2 per day to counter act her side-effects of the treatment. We have tried to no avail to get at least a month's dosage (60 pills at a time) but the insurance company is not budging - even with our renal Doctor's submission of proof of need. Cristina requires a weekly medication to prevent osteoporosis as a result of the chemo treatment. She lost the final dose (originally a small packet of 4 pills) and the insurance company would not let her get a refill one week sooner. Hence, Cristina missed her anti-osteoporosis medication that week. 11. June 9th, 2007 - Health wise, Cristina had to go to the hospital last week for some unplanned blood work. One of her two renal doctors (Dr. Ix) discovered that her blood titer test for the AGBM antigens may be on the rise (2.5 & 2.7 were the last two results). If this value exceeds 3.0 then Cristina may experience a relapse of the kidney disease. We hope that this is only a false alarm and purely a matter of statistical deviation. Hi all, it's been over two weeks since the last update [Cristina's Health Update - 6] but I'll try to be brief...thanks for your continued interest and support. So if you have not noticed or been around to notice Cristina cut her hair about two weeks ago. She donated the long braid to 'Locks of Love' - a non-profit that makes wigs for children who have hair loss. It took me a day to get used to the new look but it looks great! 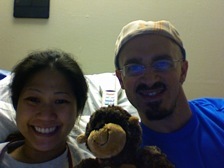 Medically speaking it looks like the AGBM tests are cleared again and Cristina is at about 50% kidney function. We have to wait for another test result or two and then Cristina will be able to transition off of the Cytoxan (chemo treatment). Hopefully this will happen soon (in a week or so). The transition involves other medications (an ace inhibitor drug, etc). She will remain on steroids for the time being... Although Cristina's blood pressure is still unruly (often running high) and she gets other side effects such as upset stomach or muscle spasms, she is still a trooper and is trying to live her life. This means semi-regular exercise at the gym, or occasional yoga practice, and it definitely means cooking a lot. Whether at home or for our recent tango exchange event chef Tina is an almost non-stop cooking machine - at least until the muscle spasms set in. Then it's back into bed. Cristina has also helped me teach, twice now for our weekly Monday tango event and we will be traveling to Chicago to teach at our first post-kidney failure tango festival. This will be a big test in many ways but we're remaining optimistic about the whole thing. Bottom line, Cristina is embracing her life and living it as fully as possible. Insurance wise we are still waiting for Blue Shield to get their paperwork together. The big bill is looming on the horizon. Contributions are still coming in and we thank everyone once again. They've been an enormous help thus far, to our financial and mental stability. It appears that Cristina's Kidney function has leveled off at a new baseline (Creatinine ~ 2.1). From this value we can 'very roughly' estimate that her kidneys are somewhere between 20% and 70% functional. Since we don't have her original baseline kidney function we had to extrapolate these values from the normal human averages (0.4 to 1.4). We've been told that humans can survive on 1/3 of one kidney or roughly 17% functionality. 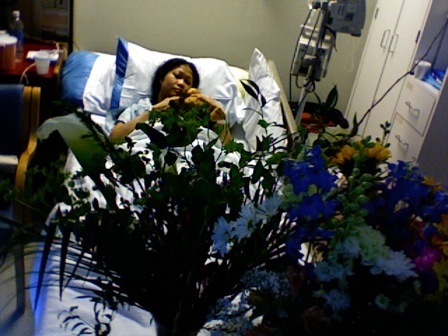 So we believe that Cristina is most likely in a relatively stable and functional condition. Cristina is off of the Cytoxan (chemo medication) and her steroid dosages are being slowly tapered. There are transitional medications that Cristina will continue to take for the time being or switch to in the near future. However, it's more than likely that she will remain on blood pressure regulating meds or 'other' meds for the rest of her life. In truth, while it appears that all is going well, Cristina continues to have side-effects from the medications and also from her less-than-normal functioning kidneys. She gets tired easily and it seems like even a 3 minute tango makes her body work very hard. Cristina continues to help me teach our local Monday class and is even working with a few private students. We had a very 'successful' trip recently to Chicago and look forward to our upcoming Seattle weekend. Hi all, this a brief but truly unfiltered post to express the good and the not so good wrt Cristina's current health situation. The True Nature of Chemo and Steroids: For the past few months both Cristina and I have been kept sane by the notion that her kidneys are getting better and she's not going to need a transplant or worse... However, now that we have settled into a long-term semi-stable condition we see the real effect that these drugs have on her day-to-day existence. In short they cause Cristina to misfire at random both physically and mentally. Some days it's 1 out of 10 times other days it's 8 out of 10 times. Also, there is an almost constant upset-stomach and on-going sense of fatigue. Insulting News: As always we get an erroneous bill from a hospital (either UCSF or Pittsburgh's UPMC), call the hospital who direct us to call insurance who direct us to call the hospital who direct us to call the insurance again who finally take responsibility and say that they'll call the hospital and clear things up. This means that they make adjustments to the bills which are still not 100% correctly finalized and again sent to us with the new threat of telling us to pay now or a bill collection agency will come after us and our credit rating will be destroyed. We're seriously considering hiring a lawyer or insurance advocate, etc. Conclusions: This past Wednesday was a really tough day since we got both the bad news and the insulting news all in the same day and even the good news was marginalized when another renal doctor co-worker informed us that, in all their statistical experience, women in Cristina's age and health range usually have a normal Creatinine of around .5 or .6 - maybe slightly higher if she's very athletic (which she is). What this translates to is a current kidney function of between 30% & 40% at best - below the previously predicted range. That's all for now. Thanks again for everyone's love and support - it has really been the key factor in our positive outlook. Unfortunately, we have our moments of crisis and thought that in this update we'd share a little more of these feelings with you. Hi all, we have been away from home for four weeks traveling to Europe for work (Berlin, Croatia) and to see family (Greece). Internet access has not been easily accessible until now. We are spending a week at our cousin’s house here in Athens and have a full-time wireless connection! Bills: We’ve paid nearly half of our anticipated hospital bills and know that a couple more are waiting for us upon our return. Thanks to the generosity of many of you we are able to make these payments and also take care of extra expenses, etc. Summary: We’ve had some wonderful experiences so far and look forward to another two weeks away and then coming back home...where we promise to continue regular doctor visits, etc. Hi folks, we've been back from Europe for several weeks now and even traveled to Portland and Boston for some fun tango events where we saw friends and danced lots. Health wise, Cristina has had some blood work and doctor's visits where they determined she was stable enough to come off of the chemo but must continue a small dose steroid treatment and a few other medications (for blood pressure regulation - which she will probably be on for life, etc). Her average Kidney function is around 50% and there has been no hint of an AGBM disease recurrence (tests all negative). Unfortunately, the chemo treatment has had it's long term toll on Cristina's reproductive system and she's now experiencing the onset of early menopause. We're not sure if this will be a temporary or permanent event. On a really positive note, our website blog (www.freshlaundrytango.info) has already been inspirational to a couple of auto-immune patients who are looking for mutual support while they undergo their own personal healing journey. Thanks to everyone who has helped out so far. We have received several private and group benefit donations and understand that several more are on the way. We will continue to keep track of all of them. While we do have insurance to cover most of our expenses, we are truly grateful for your support. The non-profit organization Project Tango is in the process of establishing a health fund & insurance for tango teachers. Thanks to everyone who has contributed (written a check to Project Tango) so far. Both individuals and group efforts across the country & Montreal have helped contribute to this fund. The Teacher's Health Fund is designed to privide financial support for tango teachers (and dancers), and one day health insurance, world wide who may be in need of such assistance. Funds can be donated via the online Project Tango PayPal link or by check. Any extra income from charitable gifts that Cristina receives and does not need for her treatment will be passed onto this Project Tango Health Fund. Cristina is doing ok, stable at approximately 50% kidney function. We really don’t know the exact number since she never had a kidney baseline to begin with but this is the average functionality we believe she has. She currently has regular follow-ups with a kidney specialist (every few months or so) to verify that things are more or less stable (however, she does not like these follow-up visits especially since we’ve had to change doctors a few times – Cristina skipped the last check-up). Also, she’s on permanent heart meds to help her kidneys maintain the proper blood pressure. Financially the fund we had set up finished about a year or so ago. We still have some health bills and accumulated debt to finish paying off (since we had to work less and spend more on health related activities/meds/etc during her first year of recovery). That’s why we’ve decided for the next two or three years to travel more and pay off our debt as quickly as possible. So far, so good. We’re both really surprised at how we are able to adapt and seek balance being on the road so often, however, we both look forward to reducing our travel about 10% each year until we reach a suitable balance of local and away time.